The final chapter of our Great Pacific Race, in Cazz’s words. As the sun rose on the morning of day 60 El stopped rowing and stared at the clouds on the horizon behind us. ‘I can see land’ she said, excitement rising in her voice. I turned around to look, and sure enough there, rising out of the cloud, were the faint outlines of the mountains of Maui. ‘Megan’ we both screamed ‘we can see Hawaii!!!’. The last time we saw land was 59 days ago. It’s hard to fathom not seeing land for that long, but instead our days had been filled looking at a distant horizon of blues and greys which often became the most incredible hues of pink orange and red during sunrise and sunset. Maui wasn’t our final destination and as such, it stayed a distant blur on the horizon for most of the day, dissappearing and then reappearing behind the clouds, a dark brown shadow against the backdrop of blue. Every glance at land bought on the realisation that the row was almost over. Part of me wanted to turn the boat around and row as hard as I could back out to the open ocean, but the knowledge that friends and family were just a mere 100 miles away kept us on track. As Maui passed by us and the sun began to set we saw lights on the horizon from lighthouses and closer to the boat from bouys marking fishing activation devices. The flashing lights pierced through the darkness, blinking on and off at given intervals, interrupting the vast horizon of black we were so used to seeing. Realisation set in that we were almost there but we were adamant to not begin celebrating early. The ocean was still toying with us, even close to land the waves were choppy,large storm clouds were circling overhead and hurricane Hector was threatening the southern Hawaiian islands. As the sun rose on what would be our final full day at sea we could clearly see the island of Molokai about 10 miles away from us. We were close enough to make out the colours of the land, see the outline of buildings and the contours of the land. The Mahi Mahi fish who had kept us company over the past few weeks had dissapeared, but instead we were treated to a Pilot Whale surfing in the waves and an ever changing collection of sea birds circling overhead. Our mobile phones, which had stayed silent for over two months began beeping as we came back into range for phone signal, messages from friends and family sent over the past two months appearing on the screens. The colours, sounds and sights of land and everyday life were overwhelming, a feeling that would stick around for the next few days as our senses were overloaded after so long at sea. 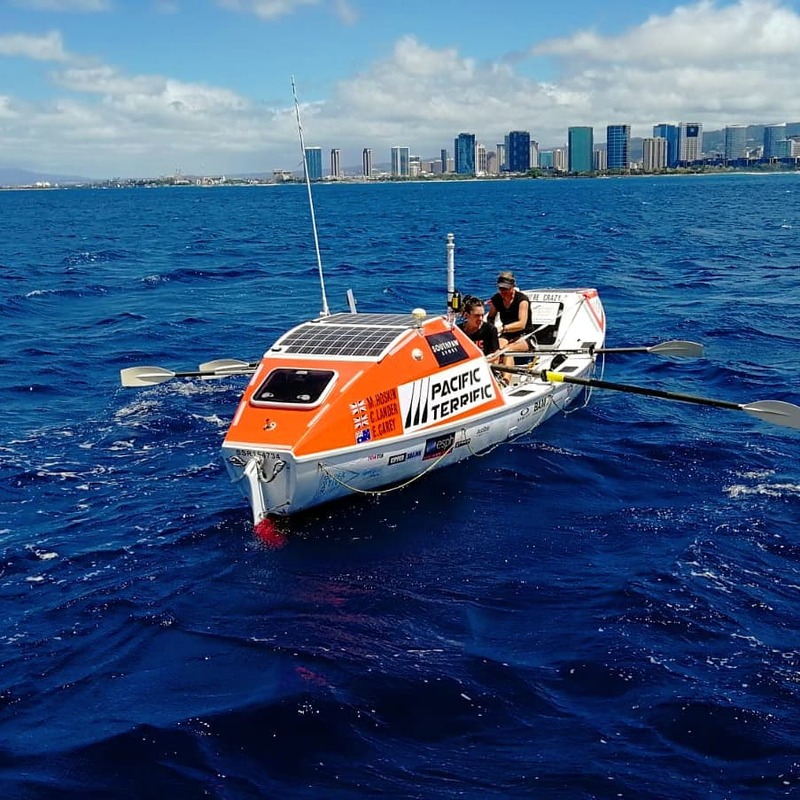 The excitement of seeing land soon wore off, and we endured a final day of sweltering heat beating down on us as we rowed towards O’ahu, which at times would make itself just visible in the distance behind our bow. The final few days on the water had provided us with a highlights package of the row. We’d been treated to beautiful blue skies to row under during the day, a final cloudless night giving us one last look at the milkyway before it faded under the light pollution from land, whale and shark sightings and a never ending line of big rolling waves in the right direction. But it seemed the ocean was determined to make us finish as we had begun, and so we spent the final night in full wet weather gear, crashing waves from the Molokai channel drenching us as they powered over the boat, squalls of rain frequently passing overhead and cloud obscuring the land we were heading towards. We wanted to arrive in daylight and so we spent the night rowing slowly, and at times just drifting, waiting for the first sign of morning to navigate around KoKo head. As the sun rose to our east, the outline of Diamond Head was visible ahead of us, the white lighthouse and red bouy marking the end of a 2400 mile journey glinting in the early light. A large sea turtle swam upto the boat, as if welcoming us to Hawaii, and the sea turned to a beautiful shade of aqua blue. The rain clouds and winds that had made our last night at sea one of the most testing faded away and reality began to sink in. 2400 miles. Two World Records. Second place in the Great Pacific Race. Elation, disbelief, astonishment and a hint of sadness that the adventure was over. We left Monterey 62 days, 18 hours and 36 minutes previously with the intention of enjoying every minute and taking in all the Pacific could throw at us. There was laughter, smiles, tears and moments I will never forget. It’s an adventure that will be hard to beat, and one that I think will take a while to sink in as to what we have achieved. I expected it to be hard, mentally challenging and physically punishing, and it was all of those things. But most importantly for me, we proved what each of us is capable of, we pushed through limits that we know no longer exisit, and crashed our way through hurdles that seemed to appear at every opportunity. 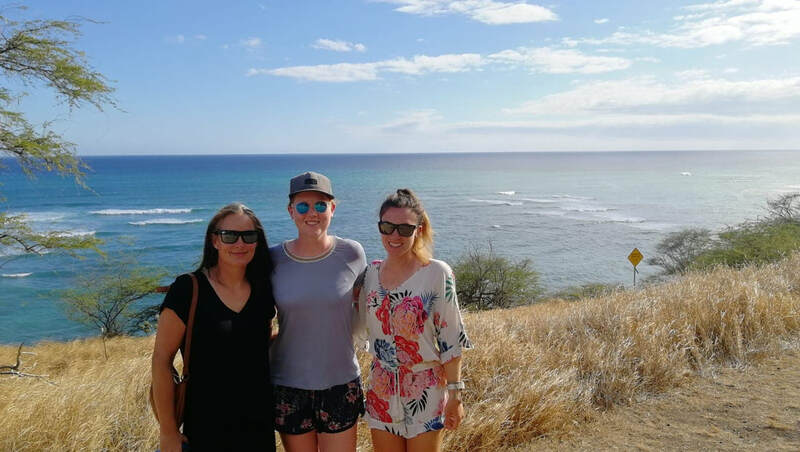 We left Monterey as three people who had met properly for the first time two weeks previously, and we arrived in Waikiki as good friends who share an incredible journey and bond. Nothing in life is easy, success requires hard work, determination and some good luck along the way. But anything is possible, your journey there may be longer or harder than others, but for all the hardest part is the first step.